When I was a kid,riding in the car, I would beg my Dad to stop for turtles we saw crossing the road. I mean, every time I saw one. "Are you crazy boy? I'm going 65 mph and it's pouring!" It wasn't my current enlightened, "let's help it across the road" turtlephillic motivation though. No, it was more the "Can I keep it? Huh? Can I keep it?" philosophy. I was a just a tad reptile crazed from birth to ... how old am I? So, ... the crazed part has mellowed, and I know not to bring every turtle home to my wild homestead, but I still get that "Oh boy, a turtle!" feeling when I see one as I drive along. These days, when it's safe for both of us, I move turtles off the road (yes, in the direction they were going)...snakes too. 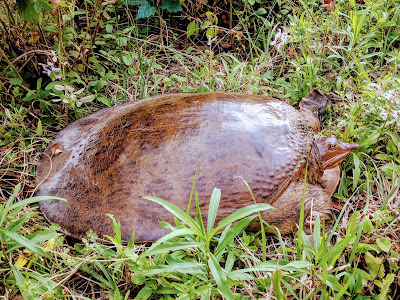 Recently I was driving on a 2 lane rural road that bisects an intermittent pond called, "Long Pond" when I spotted a big brown lump in the road. Even from a distance, I could tell it was a huge softshell turtle. I assumed it had already been killed since it remained motionless as I approached. I pulled over to look at it, and surprise! It was perfectly fine. Well, she was having none of that. She engaged full braking mode and was not gonna move. So I grabbed her from behind, held her way out in front of me to avoid that neck, and carried her off the road. The video tells the story, complete with post turtle "rescue" elation. You are such a good guy. It has lately been a trend up here for people to rescue turtles from the roads. So good to see. The emergency channels were full of a giant snapper being saved from the road by quite a cast of local folks the other day. Hope things are going well with you and yours. We always stop to save turtles too but those softshell snappers can be a challenge. One time I opened my kitchen door to find a rather large one right in front of the door. I yelled for my husband because there are steps which lead to the little porch where she was and how THE HELL DID SHE GET THERE? We were both absolutely baffled. We live in a neighborhood but it's very rural and we have a few acres and there is a lot of swampy land behind us but really...did she climb those steps? I am completely accustomed to having my chickens come up to the door to beg for treats but I'd never had a turtle there. It would have been almost impossible for anyone to come into our yard and put that turtle there. We are still boggling over it. We set her on the ground and she disappeared but I'll never forget that. What a grand rescue that was. All kinds of critters are so lucky to cross paths with you. Thank you for the rescue and for posting the video. So wonderful to see that and hear this story. We just saved a box turtle from squishage today! Makes my little finger hurt. Twelve years old (a lonnnnnng time ago! ), picked up my first softshell, learned how far that neck can reach and how fast they are. Ow.